Masters Glass Art | Read about the glass projects I am working on from day to day. 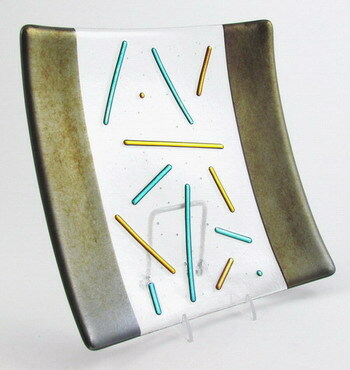 This type of fused glass plate is one of my favorites to make! By this, I mean the basket weave design. 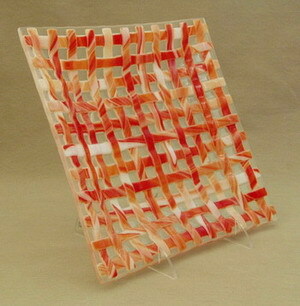 Before getting into fused glass creations, I used to weave baskets made out of various types of reed material. I really enjoyed making baskets and even sold a few. Once I started making fused glass plates, I learned a technique for creating a basket weave effect. I also make vases using this same technique. After cutting all the strips for the fused glass plate, I lay them out in a specific way. I will take 1/4 of the strips and lay them down parallel to each other, then another 1/4 of the strips and lay them down perpendicular to the other strips and so on for the rest of the strips. This gives the illusion of a basket weave. After fusing these strips together, I then fuse them to two layers of clear glass. 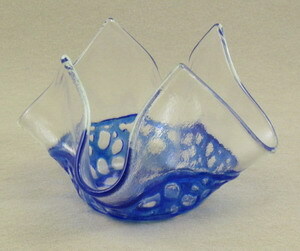 This creates a substantial fused glass plate. I love using black iridescent glass for the strips, because this glass changes colors after it is fused. Some purple and gold colors emerge, as well as others. I have always enjoyed making fused glass lace. I have incorporated it into many different projects. 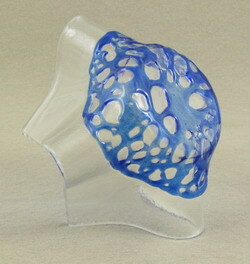 For this fused glass vase, I fused the blue glass lace to a piece of clear glass. Then, I draped the fused glass into a vase. These have been very popular at our Art Festivals. I wish I had more time to make a whole bunch of these fused glass vases! I have a piece of red glass lace that is waiting to be fused to a piece of clear glass – similar to this vase. I will post a picture when I get it done and take a picture of it. 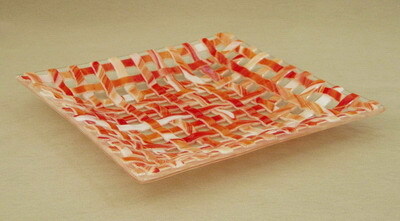 Making this fused glass plate was very fun! I had a great time picking and choosing which size and color dichroic noodles I wanted to put in the clear section. For the two borders, I used a black iridescent glass for added sparkle. These fused glass earrings are so cute! 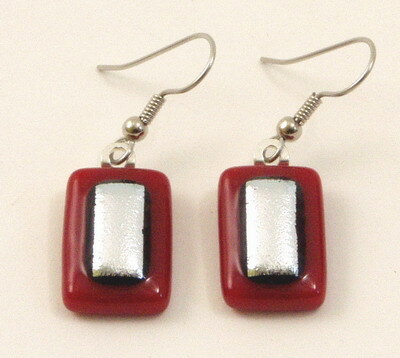 My inspiration for making these earrings came from the need for red dichroic fused glass earrings. There isn’t any dichroic glass that is red. There are a few that are close, but they are more of an orange color. So, I thought I would put silver dichroic glass on top of some red opal glass. I have made some pendants that are similar to these, as well. I recently talked with a lady who puts red translucent glass on top of silver dichroic on clear glass. This also looks very nice. I later tried this, but I couldn’t see the dichroic through the red glass. So, I realized I needed to use a thin red glass instead of the regular thickness. I keep forgetting to buy the thin glass, but one of these days I’ll get around to it! I just took a bunch of pictures of some fused glass spoon rests, vases, wine bottles stoppers and plates!! We have a couple of Art Festivals coming up this month, so I have beeen restocking the shelves with more fused glass art. I also sent a bunch of Grey Goose and Absolut Vodka Bottle Spoon Rests and Trivets to one of our Galleries in Newport, Oregon on the coast – a great Gallery: Inscapes Gallery. They should be set for a little while!! 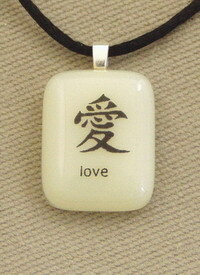 These fused glass pendants are fun to make. The black symbol is a decal and I have used many different ones. I’m not sure if the symbol is Japanese, Chinese or another language – does anyone out there know? 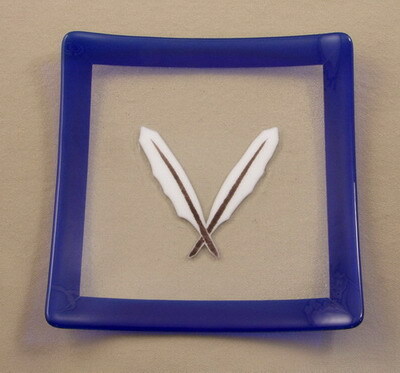 This fused glass plate was a custom order. I think it turned out very well, especially the feathers! I am giving most of the credit to my husband. He cut out all the glass and cleaned it, while I did the fusing. Each of the white feathers are one piece of glass with black frit applied on top of the white glass.